How Much Do You Judge? “Why?” is my favorite question. I like asking questions. I like to find out why we think certain ways, why we don’t think certain ways, and how our biases influence our thoughts and decisions. This is either a character flaw or a gift, depending on how you look at it. I like to think it’s both. If it fits under the realm of behavioral or social psychology, I want to learn about it. If it’s a cultural taboo or if you find it personally offensive, I really want to learn about it. What I’m fascinated with is the stories we tell ourselves to rationalize the world around us. Let’s start with an exercise example. Squatting hurts someone’s knees. Does this make squats bad? What if they had a bilateral injury? What if they have a less-than-desirable movement pattern? What if they have structural abnormalities and squatting will never feel comfortable? Perhaps squats are still awesome…just not for them. Let’s move to a food example. Scrambled eggs and steak are individually two of my favorite foods, and combined they make a magical meal. Some will tell you that this is an atrocious meal that contributes to coronary risk factors. Others will tell you that this is an incredible meal to reduce coronary risk factors. Maybe you love steak and eggs so much that you’d consider it as your Last Meal. What if it was someone else’s last meal? 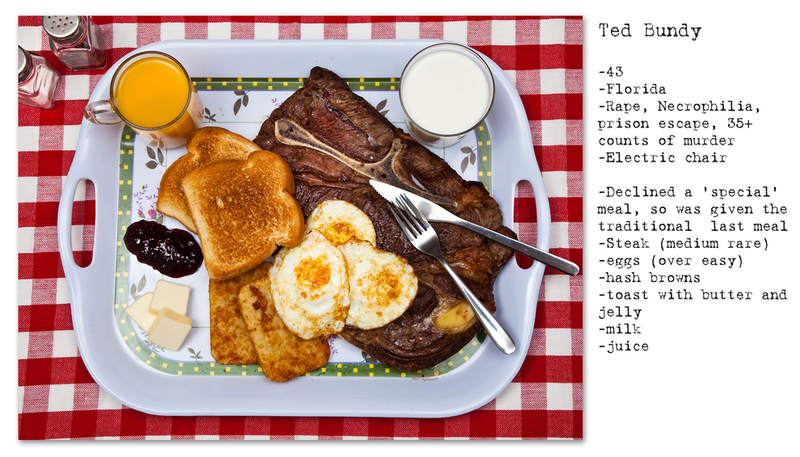 I imagine that there’s a bit of difference between ordering a medium rare steak, 3 eggs over easy, hash browns, and toast, or ordering a “Ted Bundy.” Did the meal change? No. Let’s think about what you use to eat that Ted Bundy Special. The jaw is an integral part of how we survive and thrive, and we’ve all experienced our fair share of tooth pain. Impacted wisdom teeth aren’t as fun as loosing your baby teeth, right? That’s not your dental x-ray, though. That’s Adolf Hitler’s dental x-ray. Does it look any different? No. How we perceive and interpret everything is governed by our own viewpoints of what’s right and wrong, and we often synthesize new information to reinforce these views. If you first knew that it was Ted’s last meal, or Adolf’s x-ray, you would likely be looking at their history. Seeing the meal, the picture, using their first names; this functions to remove them from their history and make them people. They were people first, before we decided to dehumanize them with our own labels. Today’s dose of darkness brought to you by _________. We’re quick to pass judgment, but careful critique and objective analysis often opens our thought to new understanding and possibility. It would seem ridiculous to think that eating steak and eggs means you’ll become Ted Bundy, or having dental work means you’ll become Adolf Hitler. We do this with exercise every day. We’re quick to disregard the importance of strength training because it will make us too muscular, or blow off breath work because it’s too soft. We disregard yoga because we only want to get stronger, or we disregard getting stronger because we always want to calm down. If you’re always trying to find the inner beauty in making things easier, then how the hell are you creating a training effect? If you’re always focused on maximal effort, maximal effective dose, being the best ever; how the hell are you enjoying yourself? There are things that can be learned from anyone and everyone in the training world, from the prototypical meathead who scoffs at the words “A recent study says…” as well as the pretentious clinician who lambasts anyone who disagrees with said study. If you’ve been training for 50 years or have never intentionally exercised, you can learn from everyone, and everyone can learn from you. Too often we miss learning experiences because we’re focused on our naïve, reductionist systems of labeling.